Justinmind v6.6: Prototyping great(er) web and mobile apps! 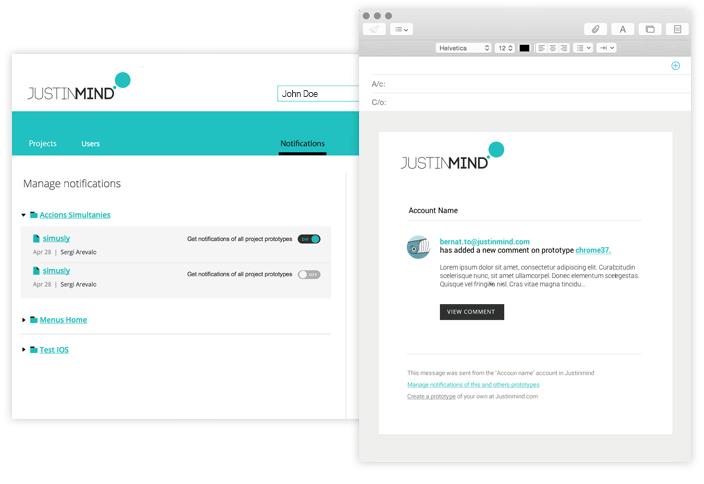 Today, we’re rolling out an updated version of Justinmind! V6.6.0 lets you make the most of your prototypes —featuring an improved collaborative prototyping process, simultaneous actions and enhanced event features! The goal with these changes and new features is to make it easier for you to collaborate with others and create richer prototypes that look and work just like the real app. While doing that we also fixed several bugs and implemented other usability improvements. Whether you’re collaborating with one or multiple people, email is one of the most important ways you communicate with those people. And as some of you pointed out, having people reviewing and posting comments to your prototype is much more useful when you get a notification about it instead of having to login to find out if there’s anything new every now and then. So, that is exactly what you are getting with this update: a comment notification system to keep you up with new comments posted on your web and mobile prototypes. Each time a new comment is posted or a comment is replied to, you will get the corresponding email notification along with two links. The First link allows easy access to the prototype in question directly from our cloud services. The link will automatically open the prototype in the screen where the last comment was posted. Just turn the comment mode on/off to keep navigating or reading and posting comments. The Second link allows you to go directly to the notification settings, so you can manage the notifications for each of your prototypes. It works great for all the projects published in your online account that need revision or feedback and it definitely fosters a more dynamic collaborative prototyping process —Simply post your comment, and your feedback will be directly delivered to your team’s inbox. With these new features and improved interactions, you can rapidly add simultaneous actions and interactions to your web or mobile prototypes. You can find the properties that allow you to do so in the events panel at the bottom of your canvas. Selecting this timing-execution option will run the actions in sequence; one action waits for the last action to finish before it executes the next one. If you’re already familiar with Justinmind, this was the default option to execute multiple actions. Selecting this option will open a dialog to set the time you want one action to wait before executing the next one. Not only will you be able to execute multiple actions at once for a single interaction but you’ll be able to run several of those interactions side by side. The new event description (more detailed and self-explanatory) in the events panel at the bottom of your editor is interactive and makes it even easier to understand and manage the actions in your events. When you have an existing DataMaster and you add any of the data widgets to your canvas, a dialog opens to choose the corresponding data —no big news there. News starts with the new function that reads “New Datamaster” and is available next to the “DataMaster” input box. This new option allows you to create and add a new DataMaster, other than the one currently available, directly from the data widget dialog, making it more efficient and practical. And if you’re a fan of DataGrids and/or DataLists it will definitely save you some time! Break out of your routine and try our new version!